Pink lemonade makes me think of summer as a kid. Days that were long and hot and spent playing outside, exploring the field or creek, catching bugs, watching fireflies, eating wild strawberries, and reading. Sometimes I really miss those long summers and having a nice vacation... But I can make some refreshing, tangy, and slightly sweet lemonade to enjoy on a summery weekend to enjoy while relaxing. 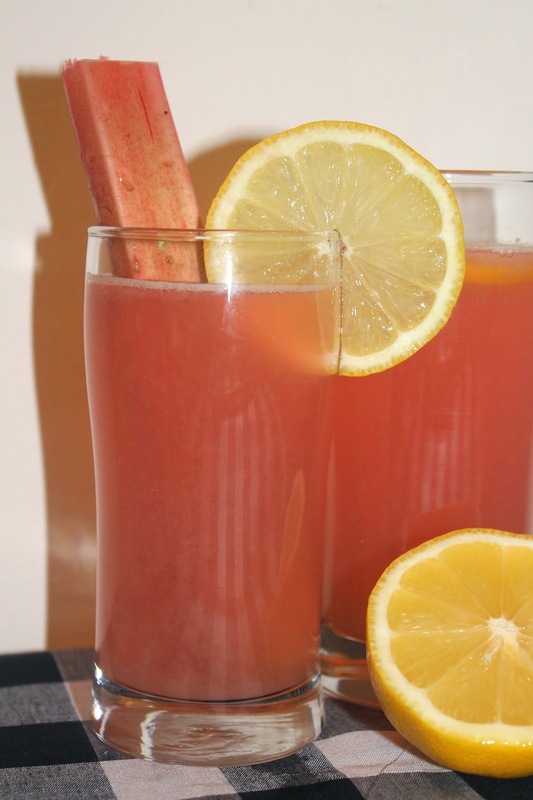 This recipe uses seasonal rhubarb to give the lemonade its pink color and also add a bit of complexity to the drink's flavor. Since we aren't big sugar eaters, I made this drink a little less sweet than what you'll probably find in most recipes. If you want it to be sweeter, up the amount of sugar to 1 cup when making the syrup. 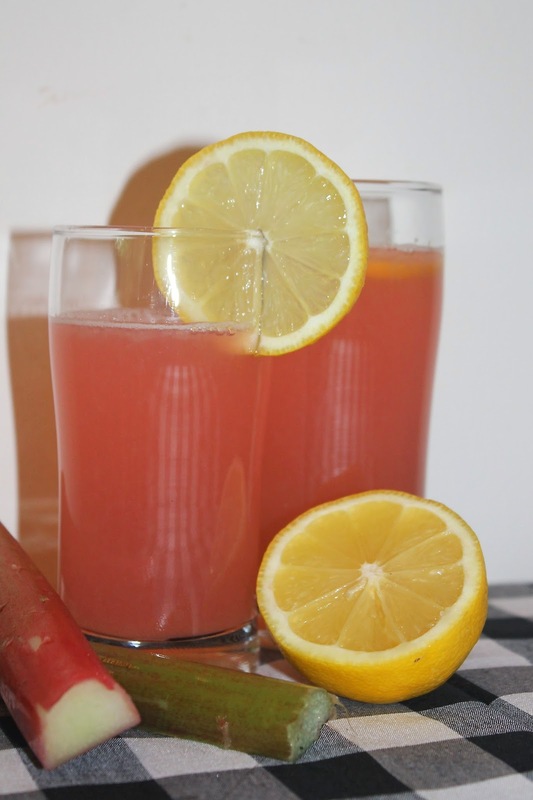 Grab a pitcher and a few glasses and make up a batch of this lemonade before the rhubarb is gone! In a medium sauce pot combine the rhubarb, 1-1/2 cups water, and the sugar. Cook over medium heat, stirring occasionally until the sugar dissloves and the mixture comes to a boil. Reduce to a simmer and cook, stirring occasionally, until the rhubarb is broken down and the mixture reduces slightly, about 10 minutes. Strain the mixture through a fine-mesh strainer, pressing to remove all of the liquid. Pour the syrup into a pitcher along with the lemon juice. Stir well and then stir in water (about 4-6 cups) until it reaches your desired flavor/dilution preference. Refrigerate for a few hours until it is very cold. Stir before serving. Serve over ice or with lemon slices, if desired. Yes, a little vodka would be a great addition! Love your description of summer, it sounds similar to mine growing up. I haven't made lemonade in years and your recipe sounds terrific. What a delicious lemonade Amy...I love the idea of rhubarb in it...it sure looks pretty too. I love this! 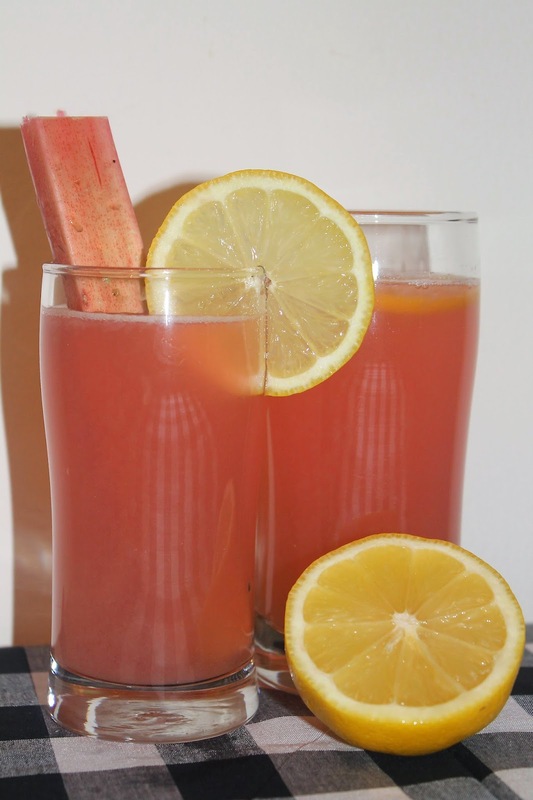 Never had rhubarb lemonade, but the idea sounds so right. Definitely something I need to try -- thanks. What a clever combination Amy, this looks so refreshing. Never thought to use rhubarb this way. In New Hampshire, a soda company made rhubarb sodas that were so refreshing on a hot summer day. This sounds like a perfect hot weather combo. I am so going to try and make my own lemonade! This is different in a good way! I never saw rhubarb in a drink before. It looks delicious and refreshing! Great summer lemonade!! I love the rhubarb addition! This looks like such a refreshing drink and the color is beautiful! Oh yeah....it is nearly rhubarb season and I will be looking for all kinds of ways to serve it. I never thought of drinking it before. Great idea. I thought it didn't get better than fresh lemonade, but then you went and added rhubarb. YUM! Well hello!!! I just happen to have lots of rhubarb...lucky me!!! What a neat way to use rhubarb!! Pinned!